Findlay & Niemeyer was founded when Hudson Findlay came up from the Cape Province. He opened an attorneys practice in Pretoria, in about 1892 under the name J H L Findlay. A year or so later he took Charles James Rice into Partnership, and they practised under the name Findlay & Rice. That partnership was dissolved and he went into partnership with N J Macrobert (who had married Hudson Findlay's cousin) and with his brother-in-law, Gustav Niemeyer. 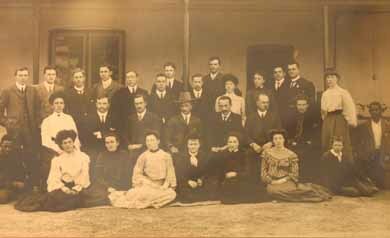 "The Landdros of Pretoria with his staff and members of the Attorneys Proffession - 1897"
At about the turn of the century the firm's offices were in Pretorius Street, behind the Old Raadsaal Building, which opens onto Church Square. When the Anglo Boer War Broke out in 1898 Hudson Findlay decided that he could not align himself with either side. His wife was a Niemeyer, and a citizen of the Transvaal Republic (and at least two of her brothers were actively fighting for the boers) while he himself was a citizen of the Cape Colony. If he had been captured while fighting for the boers, he would have been classified as a traitor, and could have faced the death penalty for treason. He decided to abandon his practice for the duration of the war, so he locked up the offices and went to live in the Cape with his family. On his return to Pretoria after the war, he took the key out of his pocket and opened the front door, to find everything in his offices, just as he had left it , dusty, but untouched! In about 1910 Macrobert left them to establish the firm Macrobert De Villiers and Hitge (now known as Macroberts) and Findlay continued to practise under the firm's present name of Findlay and Niemeyer. His eldest son, George Findlay, was a partner in the firm for a time, and then became an Advocate and practised at the Pretoria Bar until his retirement in the 1970's. Hudson's son-in-law, Owen Price, was a partner in the firm from the 1920's and managed it from Hudson Findlay's death in 1942, until 1977, when he retired. During this period from about 1946 to 1974 Etienne De Villiers was a partner in the firm. The firm has been run by Owen Price's son, John Price (Hudson Findlay's grandson), from 1977 to the present time.